Willie Chan tells you all about their trip here! Jackie loves business, so he has gone and opened another restaurant! This one is called a "fusion" restaurant which means that it blends (fuses) foods from different cultures. To see video from the opening, click here. To read lots more about this, check out Jackie's Scrapbook at the main site. Many celebrities attended the grand opening. If you're in China, it's already May 22nd and it's Willie's birthday. Happy Birthday to Willie from everyone at the Kids Corner. Thank you for all you do for Jackie and for us. We love you Willie! 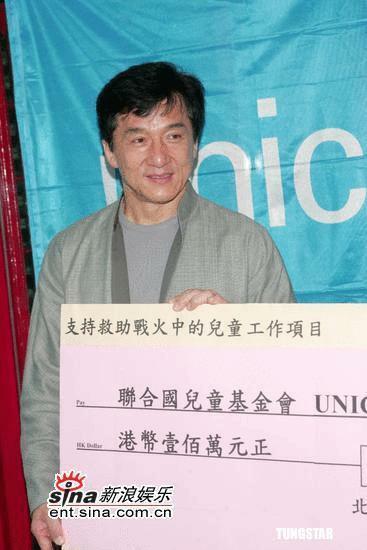 When I saw Jackie doing all these great things for other people I decided I would start a bank for donating. I am going to try to save any spare money I have and at the end of the year add it all up and donate it to charity. Congratulations, Julia. All of your friends here at the Kids Corner are very proud of you! 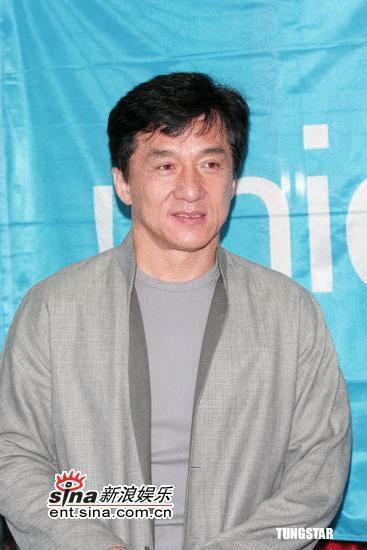 Jackie is the producer of an animated film (due out in 2007) called "The Wind." 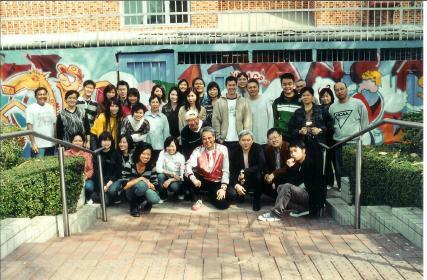 The making of this film is being led by acclaimed Taiwanese film director Edward Yang. 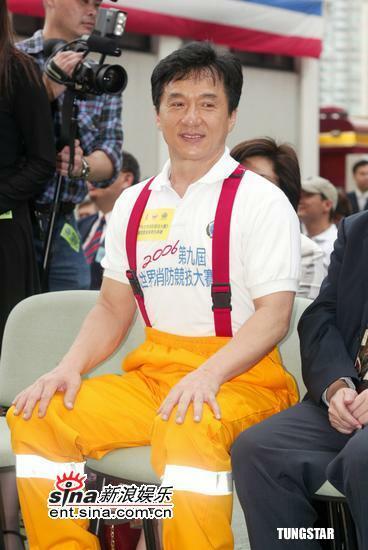 According to an article in the Taipei Times, the movie will feature a young man with extraordinary kung fu abilities. His face will be designed to resemble Jackie. 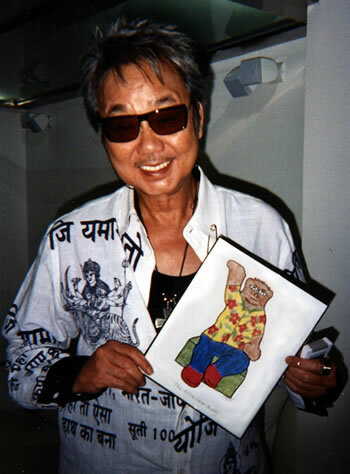 Edward Yang has been making movies for a long time and is very well respected. 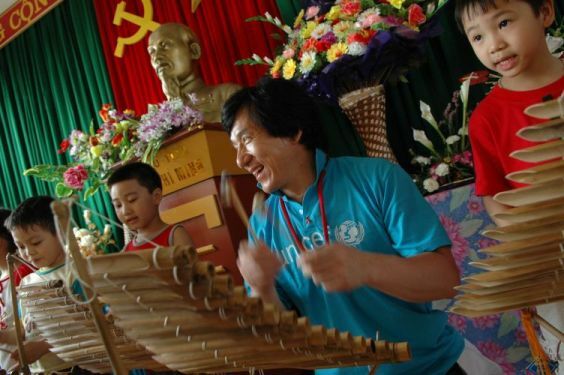 One of his most wonderful films was "Yi Yi" which you can read about here. If you have a chance to see Yi Yi, see it! It's extraordinary. 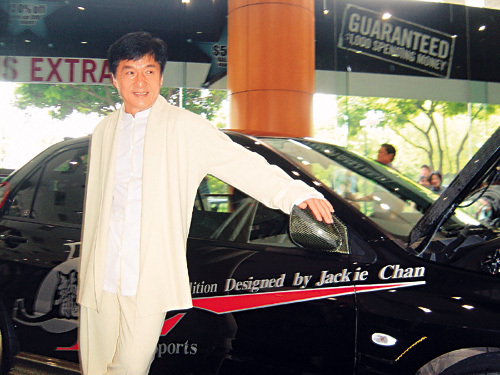 Jackie fulfilled another one of his dreams by designing a car for Mitsubishi Motors. Check it out! The Cannes Film Festival is a great place to introduce films because there is so much media attention. 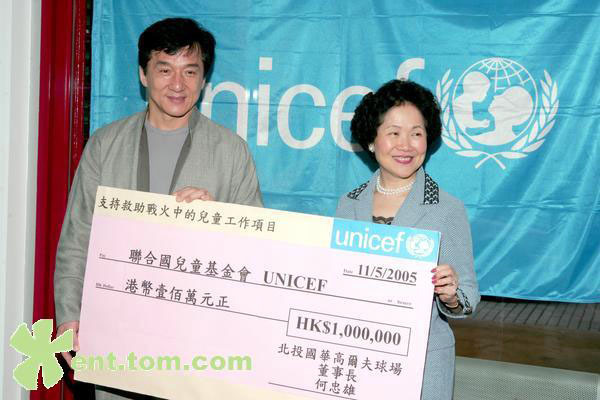 Here are some more photos of Jackie with Kim Hee-Seon, Mallika Sherawat, Tony Leung, Stanley Tong, etc. 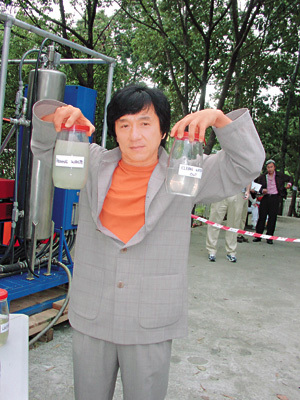 To see lots more photos, visit JackieChan.com's news. Jackie At Cannes Film Festival! 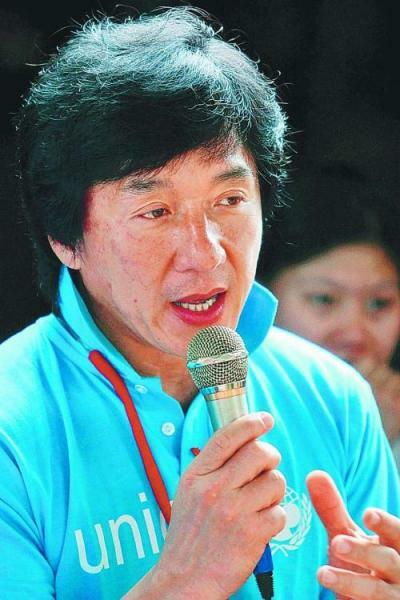 Jackie has joined his co-stars in France for the 58th Annual Cannes Film Festival. Below you will see photos of Tony Leung, Mallika Sherawat, Kim Hee-Seon, and director Stanley Tong (and Jackie, of course). 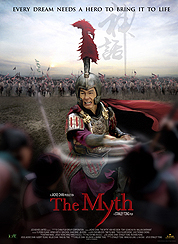 Jackie will introduce "The Myth" to an international audience while in Cannes. 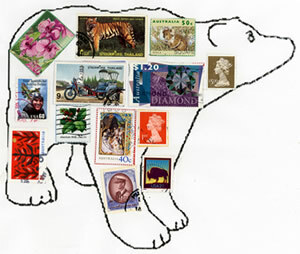 Check out this unique and amazing Buddy Bear from our talented friend Petra of Germany. Wow! 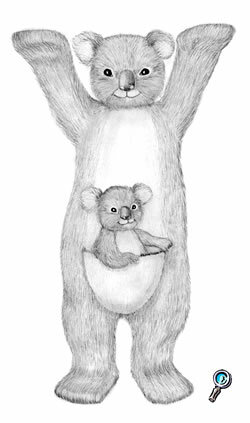 To see all the Buddy Bears, click here. Several months ago the Kids Corner webmaster received an email from our friend Victoria in England. "Have you received my Buddy Bears in the mail yet?" Well, the answer was "No" and we feared that the bears were lost somewhere between England and New York. Well, this week they showed up in the Kids Corner Mailbox! They took TWO MONTHS to get across the Atlantic! 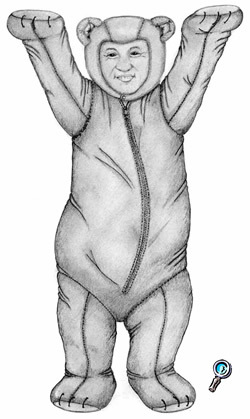 We're happy to present Victoria's latest collection of Buddy Bears. Thanks Victoria! 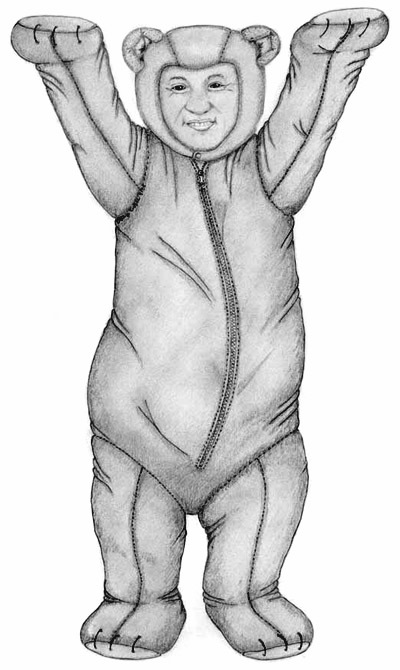 CLICK THE BEAR TO SEE ALL OF VICTORIA'S NEW DESIGNS! Jackie has a new four-legged friend! 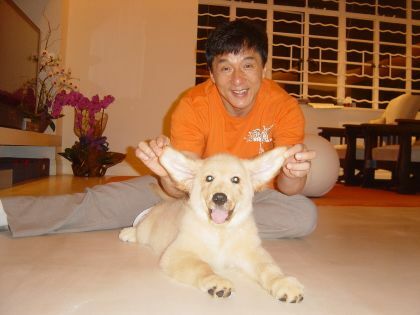 "Jones" is the Golden Retriever puppy that Jackie's son bought for his mom. Looks like Jackie's having fun! 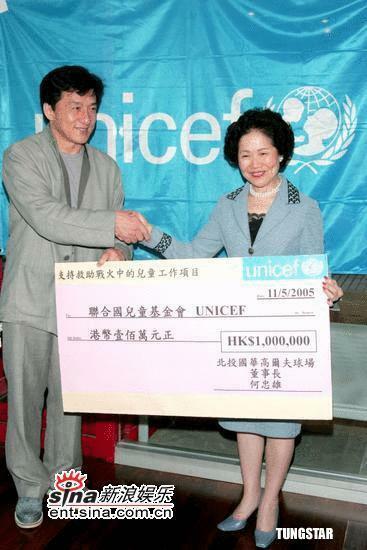 Jackie joined Hong Kong committee vice-chairman Anson Chan to present a check for HK$1 million to UNICEF. 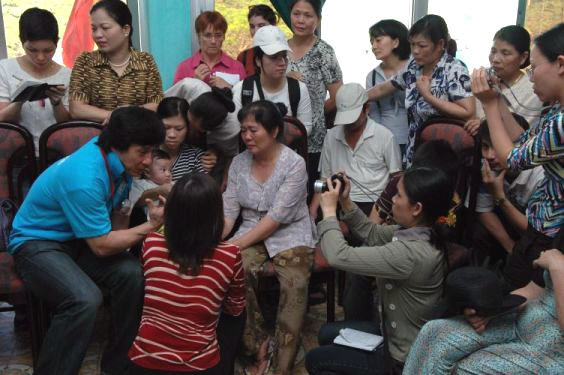 The money will be used to help children who have lost limbs to landmine accidents. 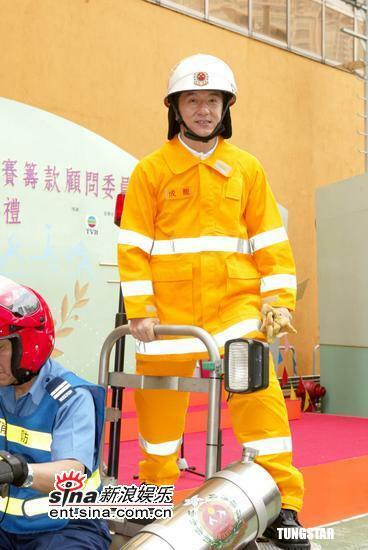 To watch a video of the press conference (PLUS a little bit of Jackie riding his Segway! ), click here. Several months ago the Kids Corner took a survey and asked about some of the things you'd like to see here. One thing that many of you mentioned was that you'd like Jackie to communicate with you. Well, you asked for it and now you've got it. 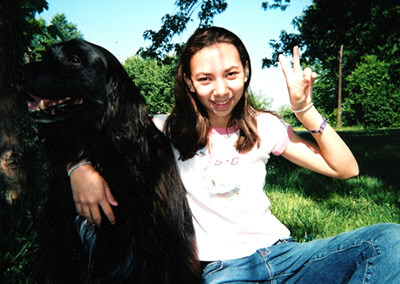 Check out Jackie's letter to the Kids Corner! How can an archeologist protect his principles? How can a romance span millennia? Why does it hurt so much when someone you trust betrays you? 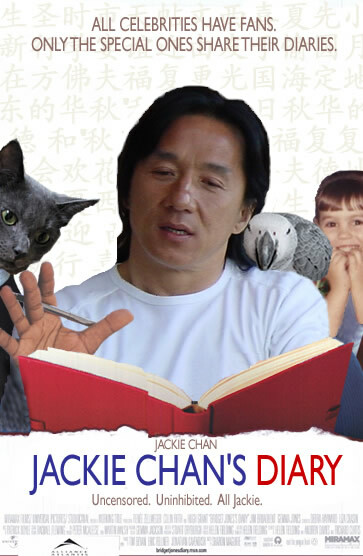 Jackie's diaries have returned as "Jackie's Journal." You can read them on the Official Site by clicking here! 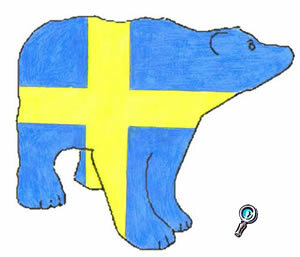 CLICK ON PETRA'S BUDDY BEAR TO SEE MORE! "Fireman Jackie" Coloring Page from Holly! Holly is back from China and is busy making new coloring projects for everyone. Her latest is the "Fireman Jackie" pose. Click the thumbnail to print out this cool coloring page! Well, Jackie wasn't really the photographer for this shoot. However, he did impress the photography team with his endurance during the lengthy shoot for the new California Fitness Gyms. 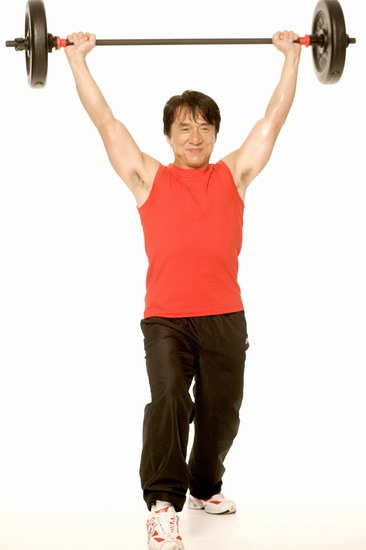 Jackie had to repeatedly jump, lift weights, and pose. He never complained and, apparently, never got tired. 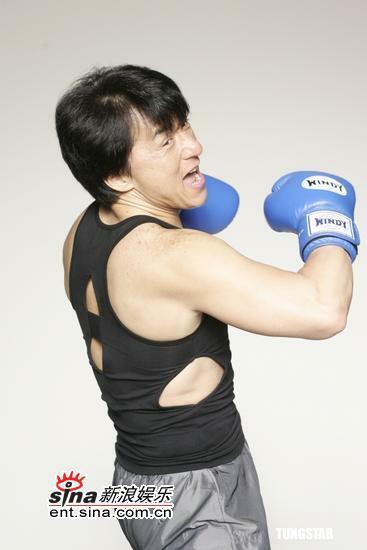 Looking good, Jackie! 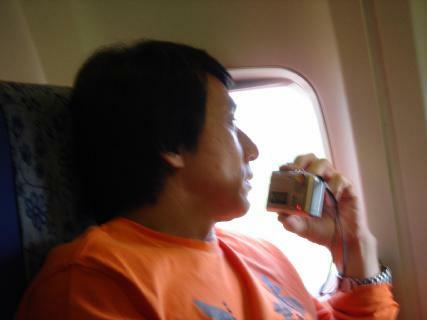 With a fresh new look and a new name ("Jackie's Journal"), this popular feature from the old JackieChan.com is getting set to return. 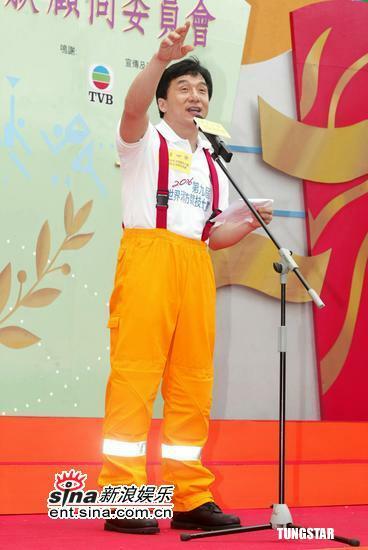 Jackie will share his innermost thoughts, ideas, and advice with his adoring fans. Hurrah! 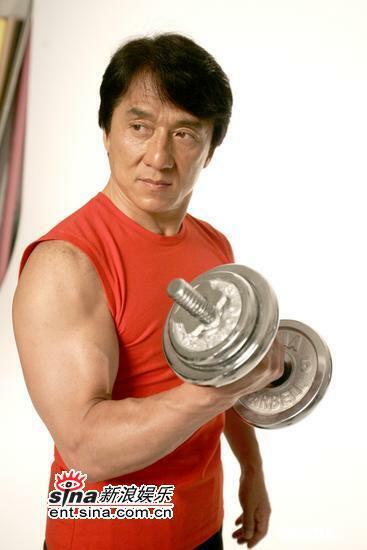 THIS PHOTO PROJECT IS FROM THE KIDS CORNER "JACKIE CHAN MOVIES THAT WEREN'T" SECTION! According to Variety Magazine, Chris Tucker is "expected to sign a two-picture, $40 million contract at New Line Cinema." New Line is anxious to get the next in the mega-money-making Rush Hour series made. Keep in mind that Rush Hour 3 rumors start up every few months, so this may be just another one. Let's keep our fingers crossed for the next Rush Hour movie! 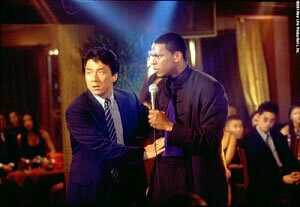 Jackie with Chris Tucker in Rush Hour 2. Video (and a few more photos) of "Fireman Jackie"
Click here to see video of Jackie at the World Firefighter Games press conference! 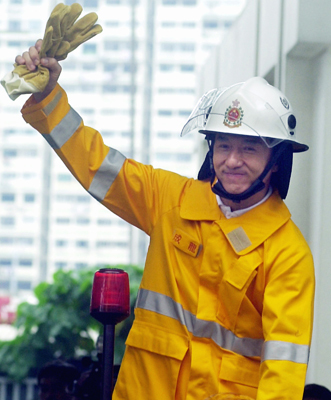 Yesterday, Jackie got all dressed up as a firefighter to lend his support to the next World Firefighter Games in Hong Kong (February, 2006). 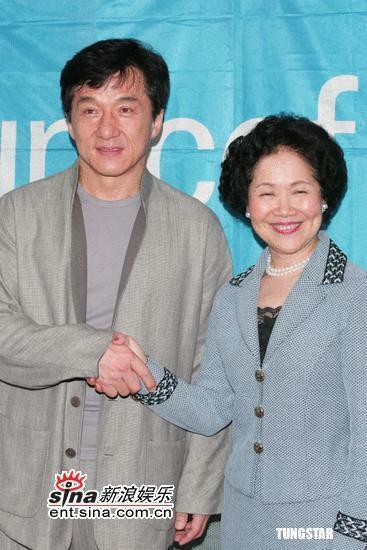 "A lot of people call me a hero," said Jackie. "Well, (firefighters) are real heroes; they are nameless heroes." 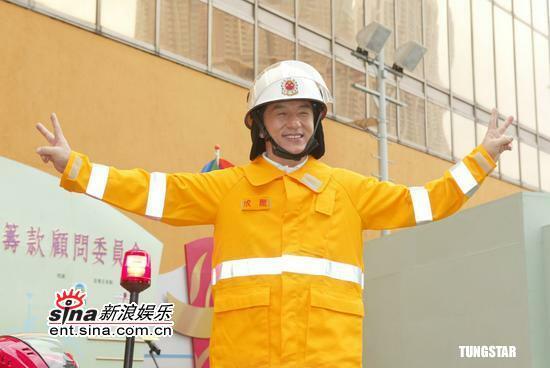 Jackie said he hopes to make a movie about firefighters. "I have had the script for 20 years," he said. "It is a dream of mine to make this film; if I do not make it, I will regret it."